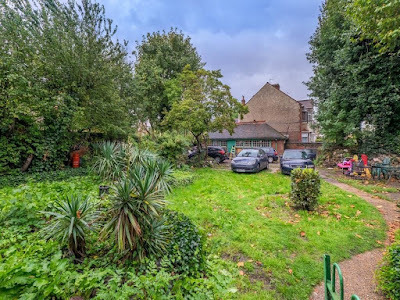 Reluctant as we are to add to the property price madness that is sweeping Forest Gate, it is worth noting that one of the district's more distinct, and Grade 11 listed, houses is currently up for sale by Your Move at a guide price of £2m. The house and its architect are of local historic interest. According to the British Listed Buildings website. It was built in 1878 and probably designed by John Thomas Newman FRIBA (1831-96) as his family home, in an eclectic Queen Anne style. It had a verandah added to the rear prior to 1920. The single-storey conservatory to the south-west was given a tile roof sometime after 1939. Below we present a (slightly) edited, and quite architecturally detailed, description of the house. This comes from the listed buildings website, here, and is the English Heritage's justification for their award of Grade 11 listed status to it. We are grateful for, and acknowledge, their copyright of the information. 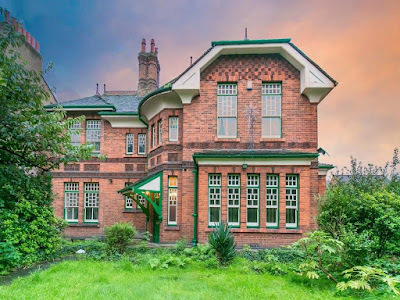 The house was built in 1878 and originally occupied, and presumably designed, by the noted local architect John Thomas Newman FRIBA (1831-96). Newman was the surveyor and head of the Mechanists Department at the Victoria Dock (1861-5) before setting up in private practice (1865-79) and was later architect to the West Ham and Leyton Schools Boards (for which he designed around 30 schools), surveyor to the London Hospital Estates Sub-committee and to the Council of the Bishop of St Albans Fund. Several of his buildings are listed at Grade II, among them the Protestant Martyrs Memorial at St John's Church, Stratford (1878). 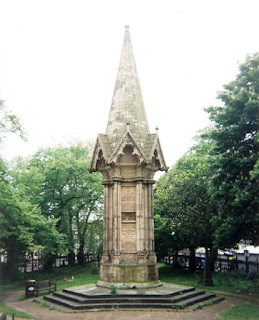 This 65 feet monument (see photo) was erected to commemorate the death, burned at the stake, of 18 protestant martyrs in and around Stratford in 1556, on the orders of Queen Mary Tudor ("Bloody Mary"). Newman's other work included three churches, Christchurch, Sutton (1887-8), St Margaret of Antioch, Leytonstone (1892) and St Nicholas, Kelvedon Hatch, Essex (1895) where he had moved to shortly before his death. The house was built of orange brick laid in a free Flemish bond with terracotta dressings; tile roofs with decorative ridge tiles and finials. It is rectangular in plan but with a single-storey conservatory to the south-west. The roof-plan is T-shaped with hipped gables to the west end of the front (north) and rear (south) elevations, and to the east side elevation. The exterior of this large, two-storey, detached house was designed in an eclectic Queen Anne style with decorative influences from the Aesthetic Movement. The north elevation to Romford Road has a varied roof line with a deep coved eaves cornice, comprising from east to west a lucarne with hipped roof; a semi-conical roof over the angled two-storey entrance bay; and a broad hipped gable with deep eaves with bargeboards. The windows are tall sashes (some broad, some narrow) with the upper sashes and transoms having small-paned lights with a distinctive 'Japanaiserie' lattice design, mostly with coloured glass. The sills are of interlocking terracotta blocks whilst the keys of the square-headed gauged brick lintels have terracotta reliefs of sunflowers. Further terracotta decoration occurs as a continuous band below the first-floor windows (sunflowers with foliage); square panels aligned with each window below this band (floral designs except for the two date panels over the porch bearing the date 'AD 1878'); and a second band of continuous floral motifs with a brick edging above the ground floor window lintels. The apex of the hipped gable is decorated with a chequerboard pattern of tiles with floral motifs. The ground floor rests on a shallow concrete plinth topped with chamfered blue engineering brick and has a prominent porch to the canted entrance bay with a tiled canopy supported on large wooden brackets with turned wooden spindles. The glazed front door has coloured glass lights and an eight-light transom. The western gable has a five-light square bay window with a hipped tile roof. The east and west elevations have similar bay windows The west elevation has a central lucarne with two tall windows and a terracotta finial. The rear (south) elevation has an identical hipped gable to the front elevation. A square, single-storey bay with a pent roof is set off centre and connects to a single-storey range to the south-west with a steeply pitched tile roof with tile-hung gable and continuous fenestration to the south and east with top-hinged casements and multi-light transoms. Map evidence indicates that this range was originally a glazed conservatory. The rear elevation is completed by two hip-roofed lucarnes, the western one wider than the eastern and a hipped dormer with terracotta finial set between the hipped gable and the western lucarne. On the ground floor a later timber verandah continues east from the bay window. This has a tiled hipped roof with two skylights. The fenestration on the rear elevation is less elaborate, combining multi-pane casements and sashes, most with multi-light transoms with coloured glass. There are two tall brick quatrefoil chimneystacks. The interior of the house is largely unaltered with some changes to the mezzanine level servants' rooms at the rear, the ground floor rooms to the east of the house which form a separate flat (not visited), and the kitchen/conservatory. 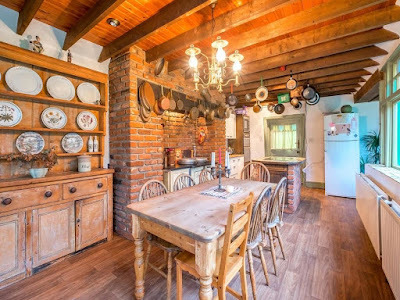 Many original features survive, often typical of the Aesthetic Movement. In the upstairs rooms there are three fireplaces with inset Milton tiles of the Shakespeare series (c.1874) designed by John Moyr Smith (1839-1912 ) and Japanaiserie floral designs, arched panelled cupboards in the bedrooms, decorative ventilation vents, original joinery including five-panel doors and more fitted cupboards on the top landing, original light switches and a Gothic ceiling rose in the stairwell. The Canadian pine Japanaiserie open-well staircase has turned balusters and newels, ball pendants, a butler's tray rest, and glazed lattice under stair panelling. On the ground floor there is a geometric design quarry tile floor to the hall and verandah, leaded window panels with coloured lights set in a wood frame between the hall and front parlour, deep covings (reflecting those externally) and heavily moulded door surrounds to the main doors off the hall. In the study/lobby at the rear of the house are three built-in Canadian pine dressers, each with two hand-painted panels depicting parables or nursery rhymes, one showing a woman with two children entering what is clearly the porch of No. 224 with the inscription 'This is the house that Jack built' and the date 1878. 'Jack' is underlined suggesting that John Thomas Newman was the designer. Also in the study is a fireplace with Japanaiserie tiles and further Moyr Smith ones from the 'Idylls of the King' series (c1875) set in a Canadian pine surround. In the rear parlour is a Canadian pine fireplace with an overmantel with shelves and spindles which match the stair balusters. The fire surround has hand-painted tiles depicting birds and flowers on a gold ground. There is full-height wooden panelling adjacent to the fireplace and the room is divided by a deeply moulded spine beam supported on consoles and has a Gothic ceiling rose. Glazed double doors pass to the modern kitchen. These have fanlight with coloured glass. The front parlour also has the same Gothic ceiling rose, deep coving and an Anaglypta ceiling finish. The room retains its dado panelling. Unusual fitted shelves below the bay window with turned spindles and a fitted dresser incorporating the coloured glazed panels through to the hall. 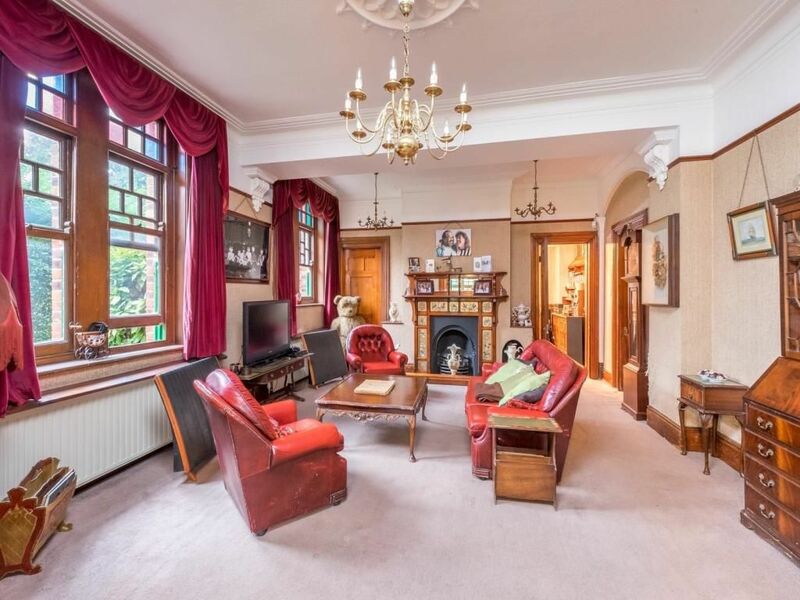 The fireplace has a wooden surround and overmantel but has lost its tile decoration. 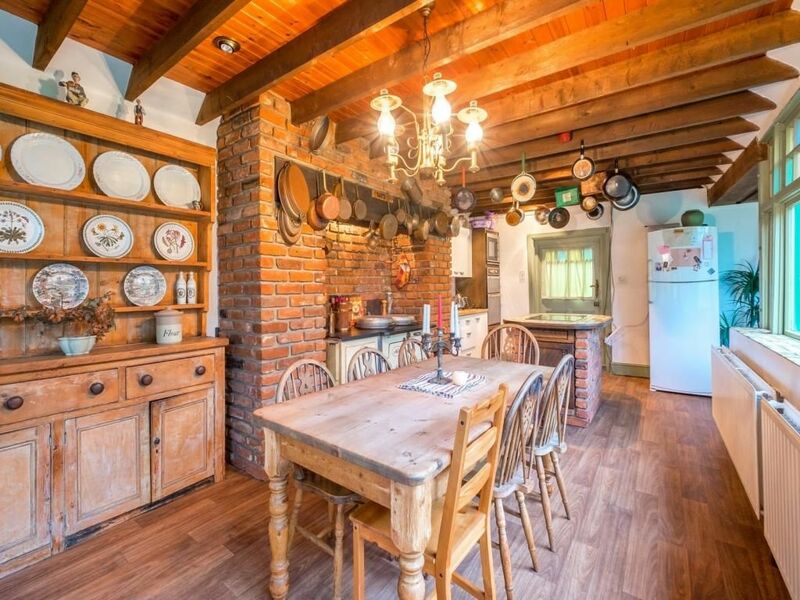 The kitchen has been extended into the original conservatory and largely modernised including a modern brick rustic fireplace although it retains its original fenestration and glazed door to the garden. The cellar retains its slate shelving. To the south of the house is a contemporary carriage house built against the south boundary wall. 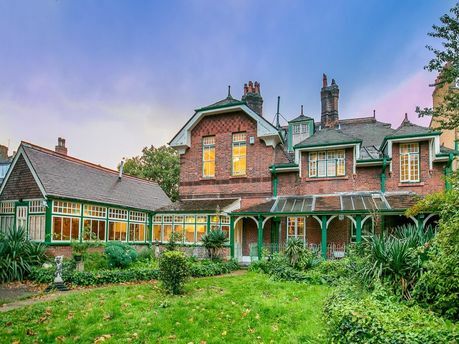 It is of orange brick on a concrete plinth with a hipped tile roof, double carriage doors to the west and fenestration to the north elevations. There is a tall brick boundary wall to Margery Park Road with an entrance to the carriage house with pyramid-capped gate piers. It adjoins the blind west wall of the former conservatory after which it continues as wooden paling on a concrete base with brick piers round into Romford Road. Both the carriage house and boundary wall to Margery Park road are of special interest. Listed building text is © Crown Copyright. Reproduced with thanks. 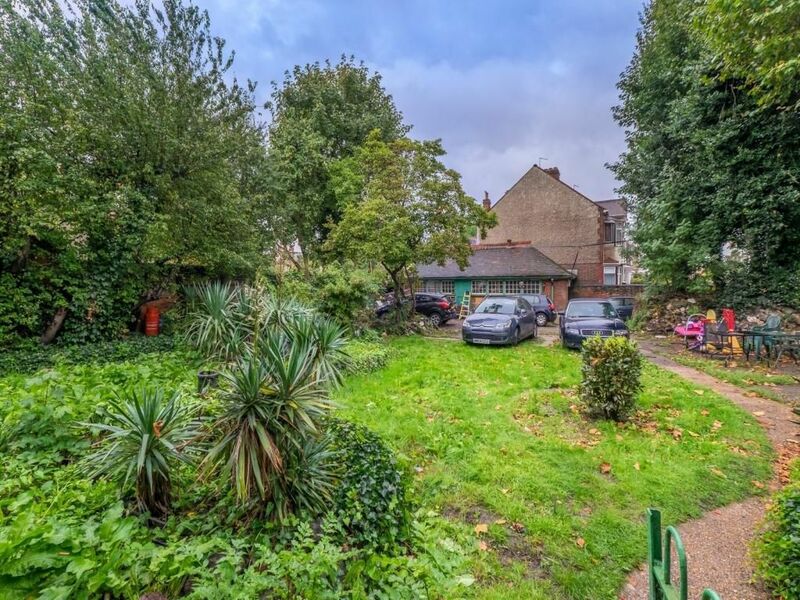 Five months on, it was back on the market, via Forest Gate's Wilkinson's at £1,800,000. Surely, it is not going to sell for £1.8M.